1749-1787. Born in Newcastle and baptised on 11 October 1749, he was the second of three sons of a bankrupt trader, Cuthbert Collingwood, and of his wife Milcah Dobson. His elder brother was Vice-Admiral Lord Cuthbert Collingwood. 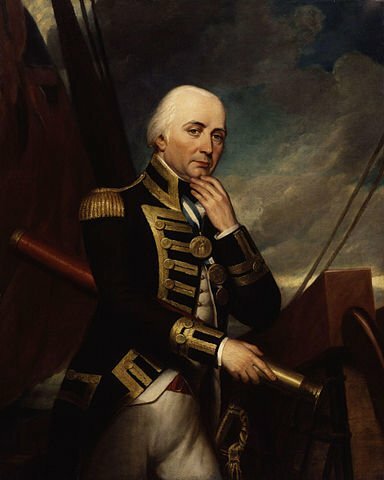 In August 1761, together with his brother, Cuthbert, Collingwood entered as a volunteer aboard the frigate Shannon 36 in the Mediterranean, commanded by his maternal uncle, Richard Braithwaite, with whom he served until the peace of 1763. He was subsequently employed under Braithwaite aboard the Gibraltar 24 from early 1766 through to March of the following year, and on the Liverpool 32 from the autumn of 1767 until the spring of 1772, both vessels being based on the Newfoundland station, with the latter later serving in the Mediterranean. Remaining with Cuthbert, he joined the guard-ship Lenox 74 at Portsmouth, commanded by a family friend, Captain Robert Roddam, in March 1772. Collingwood was commissioned lieutenant on 18 April 1778, and promotion to commander followed on 15 January 1783 with his appointment to the cutter Kite 10, which he paid off in April. Shortly afterwards he commissioned the sloop Rattler 14, going out to the Leeward Islands in February 1784. Whilst serving on this station he joined his brother and Captain Horatio Nelson in their enforcement of the Navigation Laws in opposition to the commander-in-chief, Rear-Admiral Sir Richard Hughes, which dispute culminated with a writ being served against Nelson by the islanders in May 1785. Collingwood died at sea from tuberculosis off Grenada on 21 April 1787, and he was buried in a military ceremony on St. Vincent’s. During his short career he earned the esteem and friendship of both Vice-Admiral Lord Nelson, and the future King William IV. He was described as slender with a delicate constitution.